In early 2014, Microsoft released their Word, Excel, and PowerPoint applications for the iPad. Launching their Office suite on platforms other than Windows was something that they had seemed reluctant to do for many years, and so the release of Office on iOS was a pivotal moment for the company. Even more surprising was the fact that iOS received a touch optimized version of Office before Windows did. Unfortunately, users of Android tablets seemed to be left out in the cold, and there was no indication of if or when the applications would make their way over to Google's mobile operating system. But in November 2014, Microsoft released preview versions of their Office applications for Android so they could perform testing and accumulate feedback from users. Today the Office for Android applications are graduating from their preview status to become complete supported applications that Microsoft feels are ready for widespread use. According to the company, the three applications received a combined 250,000 downloads during the preview period, and were installed on over 3000 different Android device variants. 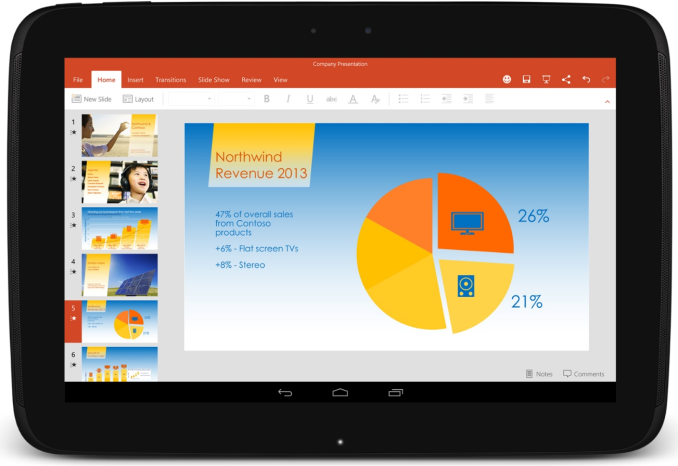 Microsoft's system requirements for the final versions of Office on Android are a device with 1GB of RAM or more, an ARM based SoC, and Android 4.4.x KitKat. Devices between 7" and 10.1" will be able to use the apps for free, while devices larger than 10.1" will require an Office 365 subscription to have access to creation and editing features. Microsoft indicates that the applications are functioning on Android 5.0 Lollipop, but that it is not currently supported. Users of Intel x86 tablets will have to wait for a support update that will be arriving later in the year. I won't ditch my Surface Pro 2 (or future tablet PCs) for this on Android. And one thing many overlook, is with desktop versions of OneNote, any Office content is copy-pastable into the pages. I can edit an Excel spreadsheet I copied from Excel into a page in OneNote. I can play a video in OneNote. I can snap a camera shot from say my phone, and instantly place it as content in a OneNote page - and annotate it with my handwriting.